Weeknights with Giada – quick and simple recipes to revamp dinner is Giada De Laurentiis’s latest cookbook. 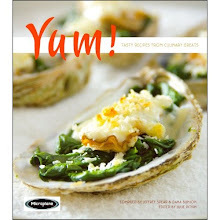 It is a go to cookbook when searching for delicious meals to get on the table quickly after a long day at work. Guess what? It isn’t all Italian recipes, Ms. De Laurentiis leans a great deal towards Italian but Hispanic, Asian and good old American cuisine are featured. Even during her busy book promotion touring schedule, Giada took the time to answer a number of my questions.